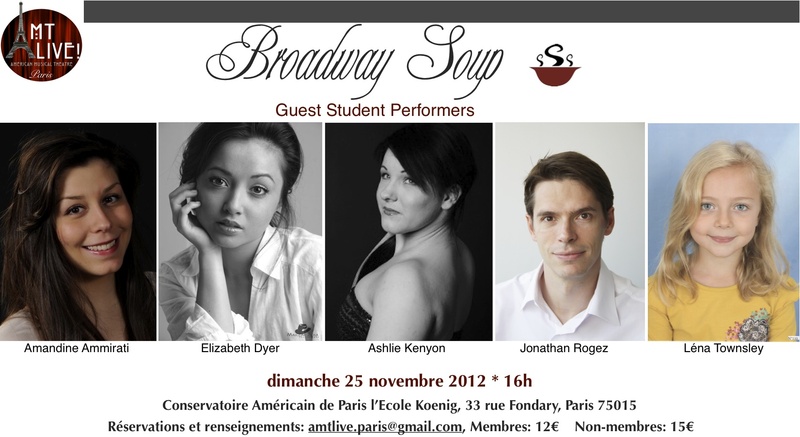 Joining us onstage for the upcoming Broadway Soup Cabaret are our invited student performers, Amandine Ammirati, Elizabeth Dyer, Ashlie Kenyon, Jonathan Rogez, and Léna Townsley. Come and cheer on our student performers as they delight audience members with a diverse selection of broadway tunes. Reservations are strongly recommended as seating is limited. Email us atamtlive.paris@gmail.com to reserve your tickets. (12€ for members and 15€ for non-members).